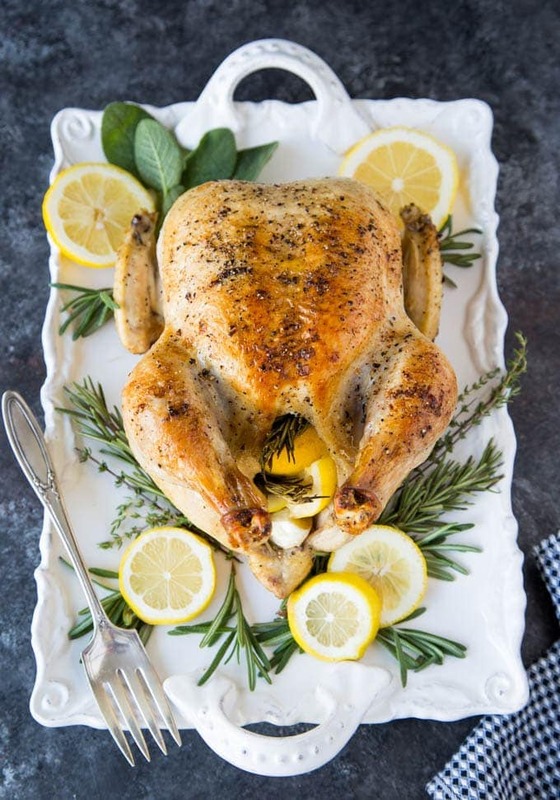 Whole Roasted Chicken with Lemon, Garlic & Rosemary- Roasting a whole chicken might sound like it would be a cumbersome endeavor, but in reality it is SUPER SIMPLE! Only 15 minutes of hands on time required and it’s a much healthier option than store-bought rotisserie chicken. 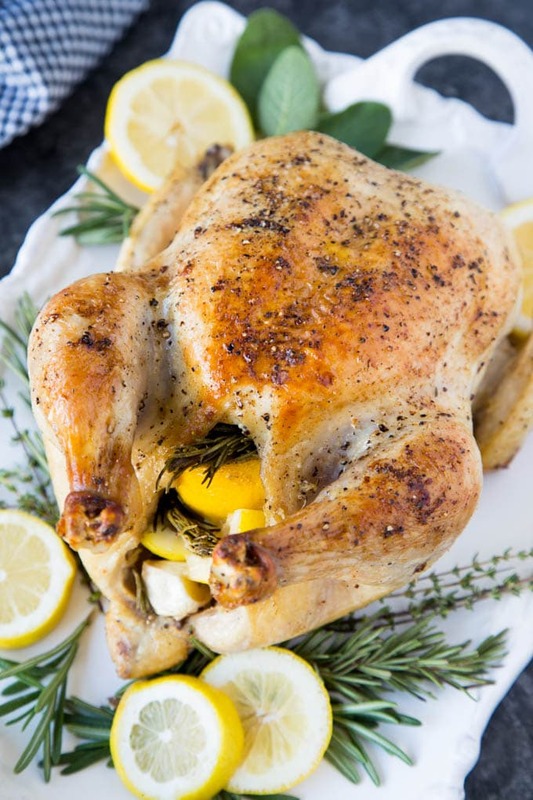 This Whole Roasted Chicken with Lemon, Garlic and Rosemary is so versatile. I dressed it up by placing the chicken on a platter and garnishing with lemon slices, rosemary and thyme sprigs. I wanted to show you how this easy dish could transform into a company worthy or holiday meal just with a bit of garnish. Serve with some Easy Roasted Winter Vegetables and/or Honey Dijon Green Beans with Bacon and Pecans and you are all set. Low stress and minimal hands on time leave more time to enjoy the party! Of course you don’t need to reserve this recipe just for company/parties. I like to make this on Sundays so I have a great meal to wind down my weekend and to have lots of leftover chicken to use for lunch meal prep and easy dinners throughout the week. 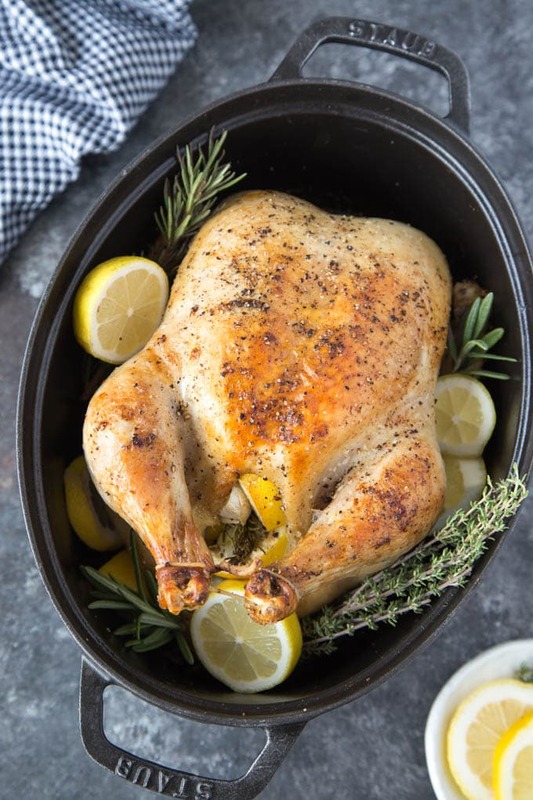 So lets talk about just how easy this Roasted Chicken with Lemon, Garlic and Rosemary is to make. What you use to cook the Whole Roasted Chicken with Lemon, Garlic and Rosemary in is up to you. The obvious choice is a large roasting pan but there are a number of other options depending on what you have/desire. You could use a cast iron skillet, a large oven safe frying pan or skillet, a rimmed baking sheet, a 9” x 13” baking pan, a dutch oven , or I’m using this Cog Au Vin Cocotte. Once you’ve decided what you’ll cook the chicken in the next step is to prepare the aromatics that will be stuffed into the cavity of the chicken ( yes, these are the things that are tucked inside the chicken that impart a huge dose of flavor) . Simply cut a lemon into quarters, cut a head of garlic in half horizontally, and have a few sprigs of rosemary ready. After you’ve given the chicken a quick rinse under water and patted dry (with paper towels). You’ll sprinkle salt and pepper in the cavity of the chicken and stuff the aromatics inside the cavity. Place the chicken breast side up in the cooking pan. The next step is to “truss” the legs of the chicken. Which basically just means tying the legs of the chicken together with some kitchen/cooking twine. You should be able to find cooking twine at your local grocers, cooking store, or on Amazon. I’m using just a bit of melted butter to rub on the outside of the chicken. I love how butter just perfectly browns and crisps the skin ( however,you can use olive oil if you prefer). Liberally salt and pepper the body of the chicken. Depending on what you are cooking the chicken in, you may want to tuck the wings of the chicken under the body. The idea is that the wings stay close to the body and the wing tips don’t burn (because they are tucked under the bird). To tuck the wings, fold the wings back and tuck the wing tips under the chicken. It’s super simple to get this Whole Roasted Chicken wtih Lemon, Garlic & Rosemary prepped for the oven. From this point on, the oven does the rest of the work. 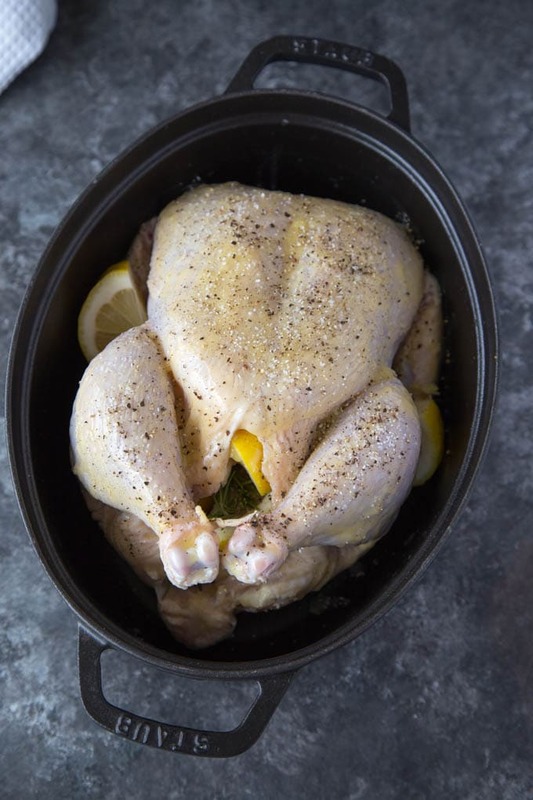 You’ll want to roast the chicken for about 45 minutes and then baste the chicken with the pan juices ( you can use a bulb baster ,a big spoon or a silicon basting brush to drizzle/brush the pan juices all over the top of the chicken.). Basting helps keep the chicken juicy and gives it great flavor. I recommend taking the chicken out of the oven (and closing the oven door) to baste. It’s easier plus then you don’t lose too much heat from the oven (which would make for longer cooking times). Continue to cook the chicken for another 20-25 minutes until the chicken is golden brown. You’ll know when the chicken is done by making a cut between the leg and thigh ( the leg joint). If the juices run clear your chicken is cooked. If it’s still a bit pink the chicken needs to cook more. If the chicken is not done, but the outside is golden brown you can cover the chicken loosely with aluminum foil until the meat is fully cooked. If you’re using a thermometer you will want the temperature at the thickest part of the chicken to be 160° F . With carryover cooking ( the chicken continues to cook a bit when removed from the oven) the internal temperature will continue to rise bringing the temperature up to the recommended 165 ° F.
You’ll want to let the chicken rest for 10- 15 minutes before carving. I’d suggest letting the chicken rest in the cooking pan prior to putting on your serving platter ( if using) . This allows the juices to collect in the chicken ( jucier meat!) and not on your serving platter or cutting board. Here’s a good video from Jamie Oliver on How to Carve a Chicken if you’re unsure how to properly carve the meat for serving. 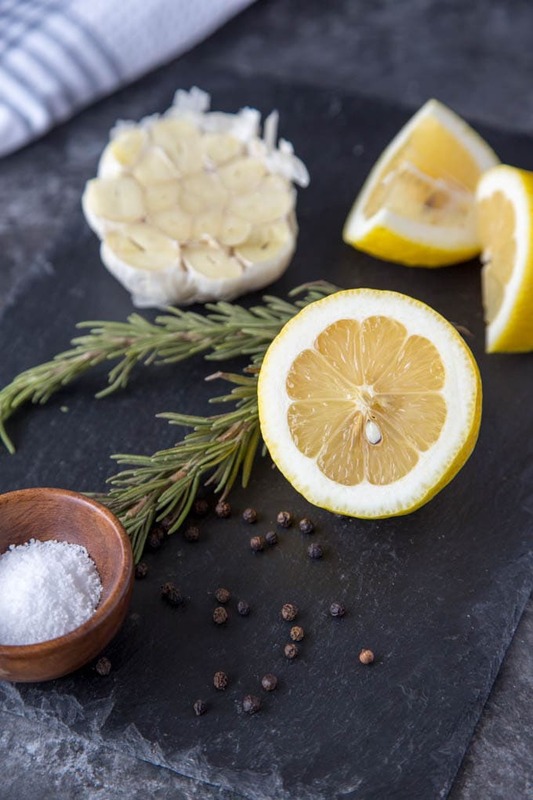 You can dress up the serving platter with some lemon slices and rosemary sprigs. I like to keep the sliced chicken pieces on hand for easy meals throughout the week. A simple salad or some roasted vegetables ( try adding a little drizzle of truffle oil to the roasted veggies! whole new level of yumminess!) and you’ve got dinner whipped up in no time. Remove the chicken giblets. Rinse chicken inside and out. Pat dry. Place chicken in a large roasting pan, breast side up. Salt and pepper the cavity of the chicken. Cut 1 lemon in quarters and stuff in the cavity along with garlic halves, and 2-3 sprigs rosemary. Truss legs (tie them together with kitchen twine). Melt butter in microwave or small pan on stove. Brush the outside of chicken with butter and sprinkle with salt and pepper. Tuck wings under the body of the chicken. Roast for 45 minutes and then baste with pan juices. Continue to cook for another 20-25 minutes, until golden brown and until the juices run clear when you cut between a leg and thigh. Lightly cover chicken with foil of chicken is browning too quickly. Remove chicken from the oven and let rest in the cooking pan for 10-15 minutes. Transfer chicken to a cutting board. Remove aromatics and vegetables from the cavity. Carve the chicken and serve on a platter. Garnish platter with remaining rosemary and lemon slices (optional). Roasting whole chickens is a beautiful thing. Add slices of lemon! Your favorite herbs. Fresh or dry. I dislike the store bought rotisserie chickens. They are never cooked to the bone. Trybit! !